Not all jobs require a work permit. Please check the CIC website for a list of jobs that are exempted from requiring a work permit. If the job you want to apply for is not on this list, you will need a work permit, even if you are doing unpaid work. If you are the citizen of a country that requires a temporary resident visa to enter Canada, you will still need to apply for visa, even if you do not need a work permit. The general rule is that if you are applying for a work permit in Canada, you will require a Labour Market Impact Assessment (LMIA). However there are exemptions to this rule under the International Mobility Program. Employers who hire foreign workers through the International Mobility Program do not need an LMIA. However, your employer does need to pay an employer compliance fee and submit an Offer of Employment form to CIC before you are allowed to apply for a work permit. This does not apply to employers who wish to hire foreign workers with open work permits. Workers covered under international agreements. For example, North American Free Trade Agreement (NAFTA) work permits allows professionals and investors to obtain work permits without a LMIA. People taking part in exchange programs such as youth exchange programs, teacher exchange programs and other joint programs. Spouses and common law partners of certain foreign students who study full time, spouses and common law partners of certain skilled foreign workers and spouses and common law partners who are in Canada and have been sponsored through the Family Class and have applied for permanent residence. Workers who are eligible for a work permit through a federal-provincial/territorial agreement. Workers nominated by a province or territory for permanent residence. The worker must have a job offer from an employer based in that territory. People already working in Canada who have applied for permanent residence through the Federal Skilled Worker program, Federal Skilled Trades Program or Canadian Experience Class. The worker must have received a positive eligibility assessment on their permanent residence application and have a work permit that will expire within the next four months to be eligible. Workers who have been transferred to their company’s Canadian operations. 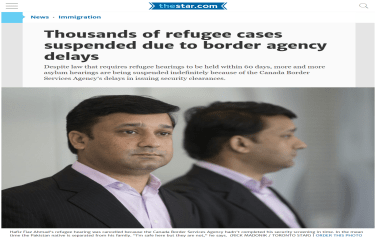 People who need to support themselves while in Canada such as those waiting for a refugee claim.